Open Die Forgings, also known as “Hand Forgings” or “Forged Block,” are manufactured in flat dies, eliminating the requirement for non-recurring tooling. They are characterized by specific grain directions (ST – Short Traverse; LT – Long Traverse; and L – Longitudinal), and are produced in many shapes, from the classic “block” configurations to bent, stepped, or curved shapes. Cost of developing closed die forging tool is cut-rate. Engineering of the component is not yet finalized and creating the closed die tooling is premature. The part requires forged properties and machining an open die forging is the most economical method to achieve your goal. The lead time for developing closed die tooling may not support your program. Aluminum Precision Products offers a wide range of Open Die Forging alloys, configurations, tempers and sizes. 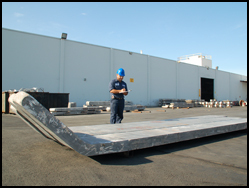 Both our Santa Ana and Oxnard facilities in California produce Open Die Forgings. APP can produce special shapes and round hollows (trepanned and/or bored). For more information see our Guide on what makes a good die forging candidate. 2014, 2024, 2219, 2618, 3003, 4032, 5083, 5086, 6061, 7049, 7050, 7075, 7079, 7149, 7150, 7175 7249, and others. All tempers including -F, O, -01, all T tempers and H tempers, including stress relieved (-T7352, T7452, etc.). Specific alloys require specific tempers. Where required, we offer precision machining of the rectangle surfaces to tolerances of +.010/-.000. We perform mechanical testing, ultrasonic inspection, and stress relief (where required) at our own facilities.